BTS once again proved their popularity around the world. 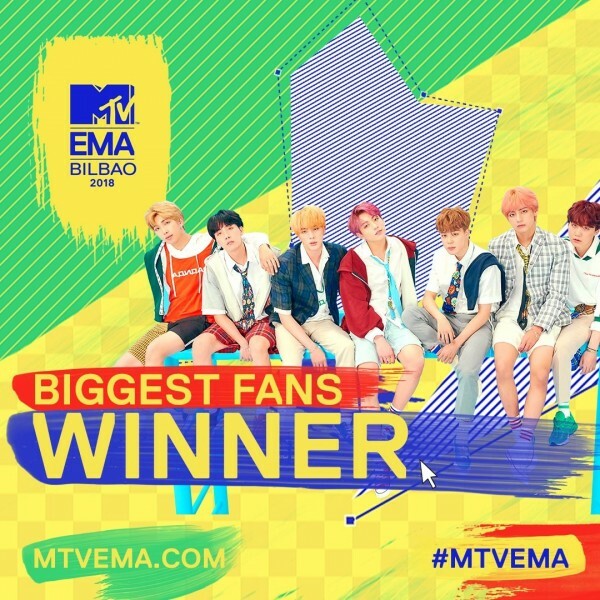 In 2018 MTV Europe Music Awards which was held on Nov 4(local time) in Spain Bilbao, BTS won the Best Group award and the Biggest Fans award. This will be the third awards that BTS received from overseas ceremony after winning ‘Top Social Artist Award’ from 2018 Billboard Music Awards and ‘Favorite Social Artist’ from 2018 American Music Awards. Meanwhile, BTS will collaborate with American singer song writer Charlie Puth on upcoming MGA.